Creating an email campaign with Book Like A Boss & MailChimp couldn't be simpler with our step-by-step guide. In case you hadn't heard of them, MailChimp is the world’s largest marketing automation platform. It’s like a second brain that helps millions of customers—from small e-commerce shops to big online retailers—find their audience, engage their customers, and build their brand. So let's jump in and get this integration set up! Once you are logged into your Book Like A Boss account, head over to the integrations page. Scroll down to 'MailChimp' and click the 'CONNECT' button. 4. 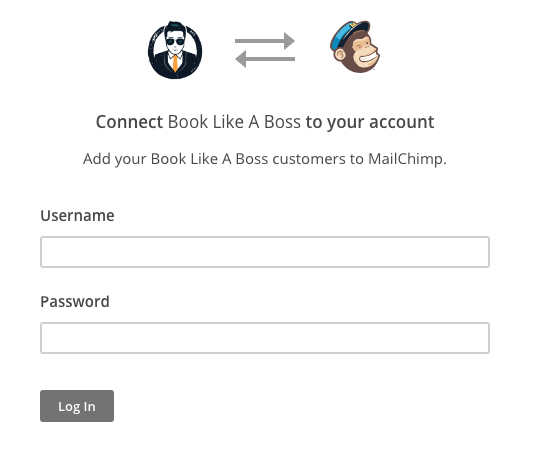 Enter in your MailChimp username and password to connect your Book Like A Boss account with MailChimp and do a little dance. You're almost to the sweet goods! 6. Click 'UPDATE' and you are set to go! 8. 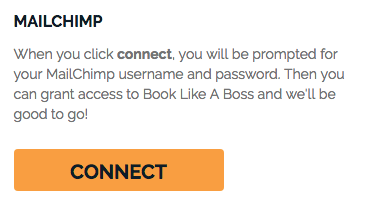 You are able to change the list at any time by clicking 'Change List' or to disconnect your Book Like A Boss account with MailChimp, click 'Disconnect'. We hope that you find this article useful and sufficiently answers your questions on this feature. If you would like any further clarity or have additional questions please send us a support ticket at support@booklikeaboss.com.